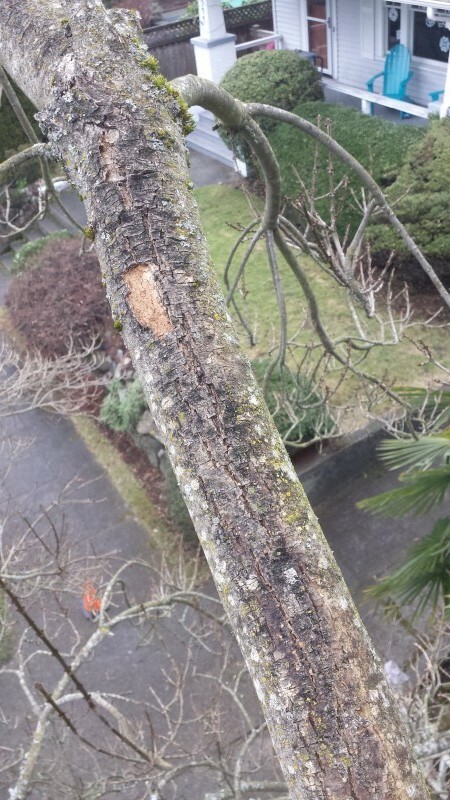 Another reason not to prune a lot out of a tree all at once- I was working in Seattle in the upper canopy of a narrow leafed Ash (Fraxinus angustifolia) last week, and noticed the top of a number of the major limbs were no longer alive. It appeared that a huge amount of foliage had been removed by the power company a couple of years prior, exposing once shaded limbs to full sun all day long. The tops of these limbs got sunburned and died. They are now more susceptible to insect pests and diseases, potentially weakening the tree. The lesson: prune in moderation whenever possible! As a general rule no more than 25% to 30% of the total leaf area (when leafed out) should be removed during any one year period. Sunscald on an Ash branch from sudden exposure to day-long sun.